When the word mint is mentioned, what do you think of? Peppermint candy, spearmint gum, mint tea? Now, what if I told you that mint is grown right here in Montana? That's right. Mint is a little green plant that is grown and harvested all around the state. There are up to 30 different kinds of mint such as peppermint and spearmint, but other than the flavor of their oils, they are all quite similar. Mint is a perennial herb, meaning that it can survive longer than two years, generally up to three or more years. Mint grows to be about two feet tall with small leaves that are only about two to three inches long. 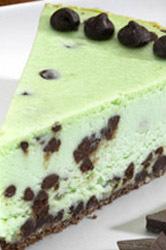 Depending on the variety of mint, the leaves range in color from a soft green to a dark bluish green. Mint can be grown in a small pot, a garden, or a field. There are roughly 75,000 acres of mint in the United States, and Montana's mint fields help to contribute to the 2,160 tons of oil that are produced each year in the U.S. You can usually tell when you are nearby a field of mint because it has a distinctive sweet and "minty" smell. There is an old mythological tale that claims the history of mint. Supposedly the Greek Goddess, Mentha, upset Pluto's wife who then turned Mentha into a mint plant. So, every time you eat a piece of mint candy . . . you're eating Mentha! Mint has a variety of uses. The leaves are harvested to be used as flavoring for food and decoration. The stems are distilled for the oil, which is also used as a flavoring for foods such as gum, candy, and drinks. The oil is also used in perfumes and cosmetics. In fact, many, many years ago an Italian chemist created what we now know as cologne by using a combination of mint and other products! Although Mint seems like an "easy" crop because the farmer does not have to replant it every year, do not be fooled! Mint is not as easy as it sounds. The planting and harvesting of mint requires extra equipment that a farmer generally does not need, such as a mint digger and a mint planter, which incurs an extra expense for the farmer. Diseases, such as powdery mildew and rust, can present a serious problem if the mint is not properly protected. Another issue that the farmer is faced with is the weed problem. 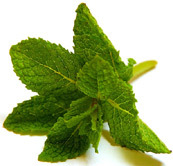 Certain weeds can tint the smell of the mint, which in turns deteriorates the value of the mint. The last, but certainly not least, problem that the farmer deals with is the very issue that once seemed to be a blessing: the fact that the farmer doesn't have to replant the mint every year. This can present a problem regarding the weather. In order for the mint to survive the winter and remain healthy there must be adequate snowfall to blanket the mint and protect it from the harsh winter winds. However, on the bright side, with the exception of the weather, all of these issues can be easily maintained with proper management, and the farmer then has an excellent chance of producing a high quality crop!